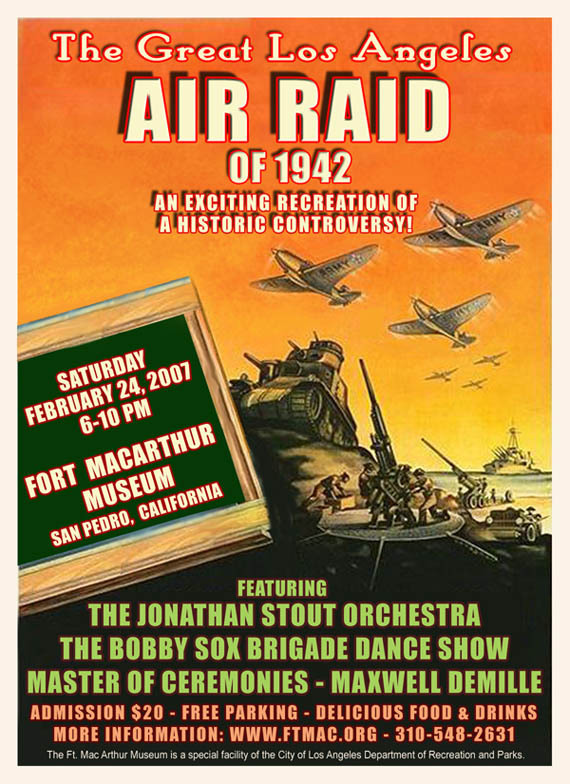 Featured in the movie "Buck Privates"
It's February, must be B-Day time again! And if it's my b-day, it must be "Western Nite"! 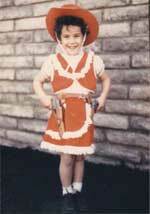 Ever since I got the outfit below at age four, I've loved the ol' West. Part of my family even came across the country in a covered wagon, so I guess I come by it honestly. I've always loved horseback riding, and when I was a kid, I could never decide which I wanted to be more, a cowgirl or an Indian, so I alternated regularly! 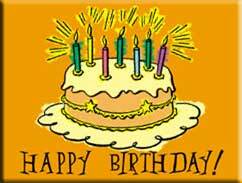 Join me in celebrating my birthday in your best vintage or vintage-inspired Western gear. There also happens to be a pretty good singer in this clip. 2.What song did this singer make famous? 3.With what famous band did this girl sing the longest? 2. 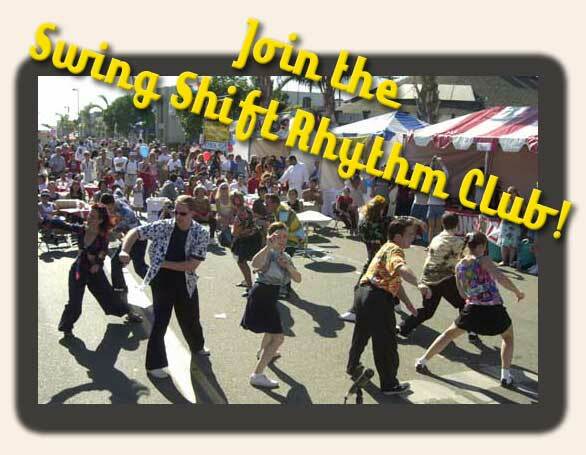 "And The Angels Sing"
REGISTER FOR LINDY BY THE SEA CLASSES HERE. MARCH-APRIL 2007 -- ONE LEADER SPOT AVAILABLE! There is ONE leader spot available for the March-April Master Track. Please let us know if you are interested info@rustyfrank.com! To hold your spot for The Master Track, send us an email with your name and the series you'd like to join. Remember, the course has a limited enrollment, so reserve your spot now. Email us at info@rustyfrank.com. YES! 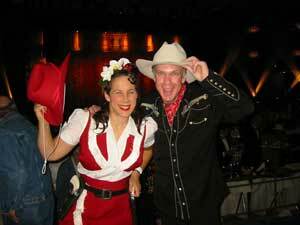 It's Cowboy Nite -- Dress Western! 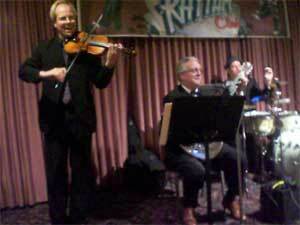 The Wiseguys - Big Band Nite! 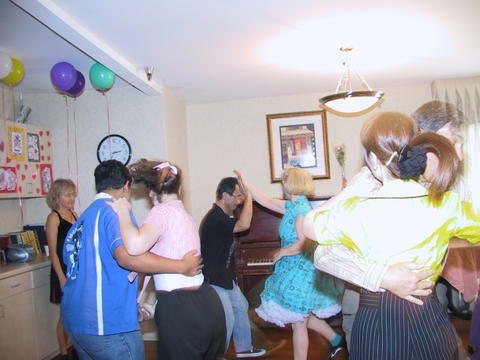 Residents and dancers were enthusiastic and this one is definitely in the "let's do it again real soon" category!!! Again my personal thanks as I was not able to plan or participate in this Event - but know I was cheering from the invisible sidelines. 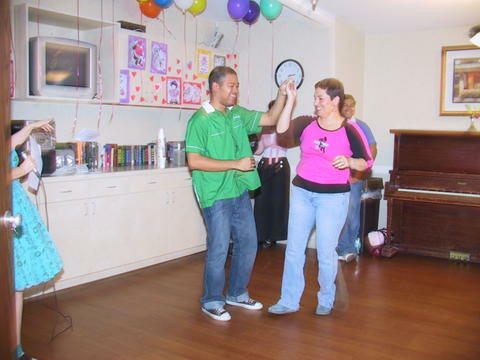 This Event was done at the request of Activity Director Joy, who is a real "hands on" worker for "her" patients. In communicating with dancer, Jamie England, whose mom is a resident here, she found out about the SSRC program. When we talked to set up date and time, she said, "anytime you want to come down, any day, morning or afternoon, we will make the room ready for you and I will be there". She was there, moving patients, tables, bringing water...what a ball of fire! 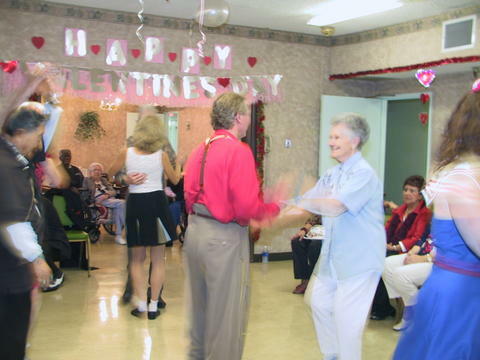 We made sure that she got to dance with all of our men, after a quick lesson in basics, of course - it was the loudest applause of the afternoon, patients and their families, and personnel. Linda and Tony Garcia - always a crowd pleaser with their special dance displays, this one a sizzling nightclub two-step - done to "Minnie the Moocher" brought in oohs and aahs from the audience, including. employees who were peeking in. June from Manhattan Beach, a friend of Scott's, who just loves to dance...and it shows! 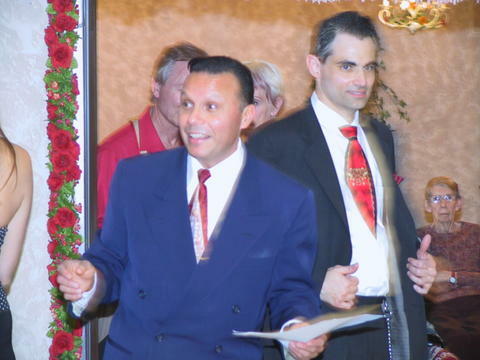 Tony Mercurio and his friend Marilyn, caught on the 91 Freeway who arrived just in time for the jazzy "Riff" number, so perfect for their style - we know he made this entrance on purpose! Our favorite moment? A somewhat surly-looking gent in a wheelchair who started moving to the music - when questioned about his obvious love for the music and dance, he was able to talk with difficulty and said he was a swing dancer. 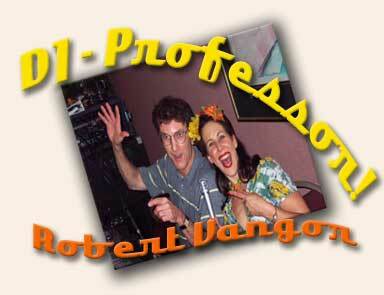 We brought him to the "stage" and he led several of the ladies during the Boogie Woogie number. Another gent had the same story, though not able to talk as well, did also lead a lady for a short time. These are the moments we aim for in this program and the process is simple...show up... dance...and watch what can happen. Also, personal apologies to some of the dancers, esp. Linda & Tony, for not sending them in more often - I am a little out of practice, but wait until next time! P.S. Special good wishes to John Apodaca, who couldn't make it at the last minute as he had a family emergency - Know we are thinking of you. 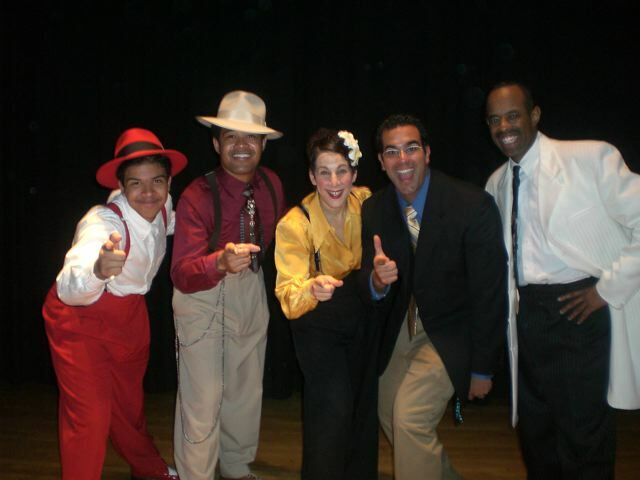 For years I have been dreaming about how to bring Lindy Hop and Tap Dance into the public schools... how to let kids know that dancing does make a difference... that dance can help make the world a better place. Last week, we did four assemblies for a total of 2,000 11-14 year old kids. The theme was to show how entertainers significantly helped break down the color line, just as did people like Martin Luther King & Rosa Parks. 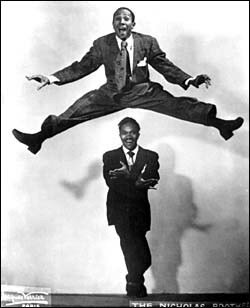 We showed clips of the Nicholas Brothers, Whitey's Lindy Hoppers, Shirley Temple & Bill Robinson (the first integrated dance duo in films - 1935! ), and the Benny Goodman Quartet (first major integrated band -- 1935!). We pointed out that entertainers started integrating 37 years before baseball, and 58 years before laws like the Fair Housing Act. 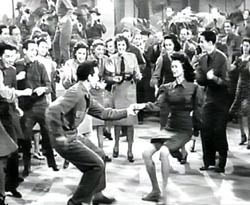 In addition to showing the clips and giving historic information, we also performed Tap, Shim Sham, and Lindy Hop. AND... we got four kids up front each assembly and put them in 1940's clothes and showed them a dance routine. The kids just LOVED the clips and our dancing. And they learned in the process -- that dancing can make a difference in this world. PERHAPS YOU KNOW A SCHOOL THAT WOULD LIKE THIS PROGRAM? If you know of any school that may be interested in this program, have them contact me at: info@rustyfrank.com or 310 606 5606. The program was designed especially for Black History Month but could be used throughout the year. You can send them to my website where I now have a page under "News & Events" called "Black History Month Program" -- click HERE to see it. 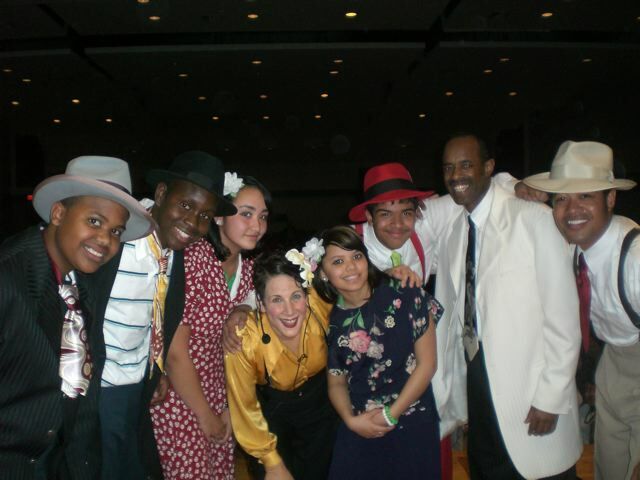 "STEPPIN' AHEAD -- DANCERS BREAKING DOWN THE COLOR BARRIER"
LEVEL 1 - FEBRUARY 2007 - CLASS PICS UP! 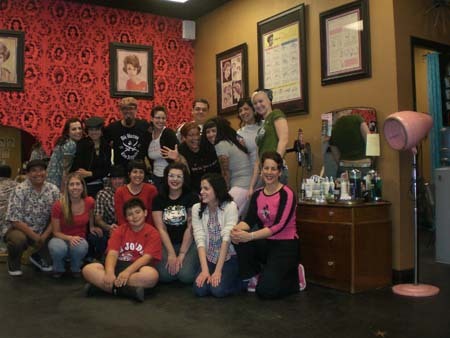 ULTRA LUX SALON CLASS -- PICS UP! RADIO MODERN - BELGIUM -- What can I say? 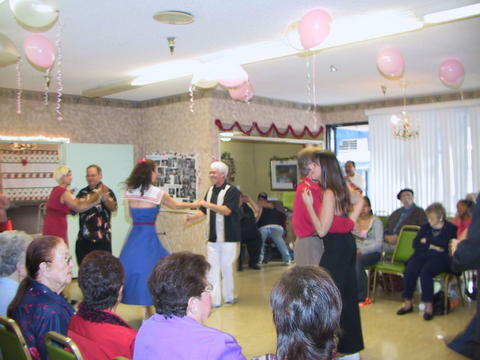 It's just plain fun seeing what other swing dancers are doing around the world. Have fun "visiting" Belgium on this site!